Home > Sibiu City Guide. European Capital of Culture 2007. 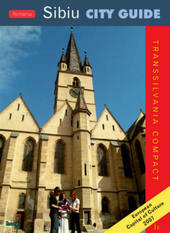 In this new and updated edition of SIBIU - CITY GUIDE you will get to know everything you need as a visitor, e.g. the major events of Sibiu's history, its architectural treasures, the museums you must visit, where to go shopping, which restaurants to go to and where to stay overnight.